The only way to see the magnificent in-between places of Spain and Portugal is to have a car. I count my lucky stars that we chose to rent one from Hertz instead of taking the train or just sticking to one spot the entire time, because it truly was one of the best if not the best trip of my life, mainly based on the total flexibility and freedom having a car and being able to go where we wanted, when we wanted. Here’s my itinerary! Keep in mind, if you have more time, I’d definitely extend it by as long as you can! Lisbon is a great place to start this road trip, because it has a solid airport that you can get to from quite a few Countries. I flew into London and then straight to Lisbon, which was the cheapest option for me. Hertz has a ton of locations throughout Europe, but their Lisbon location happened to be extremely convenient and located right inside the airport. When in the city of Lisbon itself, i’d recommend finding a good parking space and keeping your car there, since parking is VERY limited and Lisbon is such a walking city anyway so there’s no need to drive around. I could get lost in the winding Lisbon streets for hours and hours, since every single street is drop dead gorgeous. If you have more than three days to spend, then by all means stay longer in this city. There is just so much to do! Something that you absolutely cannot miss is heading to the town of Sintra to see some of the amazing castles there. We only had a day in this quaint town and so we chose two out of the many castles to tour. The town itself is so cute, but the castles really are what is so breathtaking. Each one is completely different from the rest. We chose Quinta da Regaleira and Palacio de Pena, which I can both highly recommend. At first getting into Seville from Lisbon can be a bit of a shock since it seems so different! The outside rim of the city seems much more of a typical more modern city, but it’s once you get into the old quarter that the architecture starts to blow you away! I wish I could have just dropped everything and moved there. For any Game of Thrones fans, the city of Dorne location was filmed there and you’ll definitely feel like you’re on set. 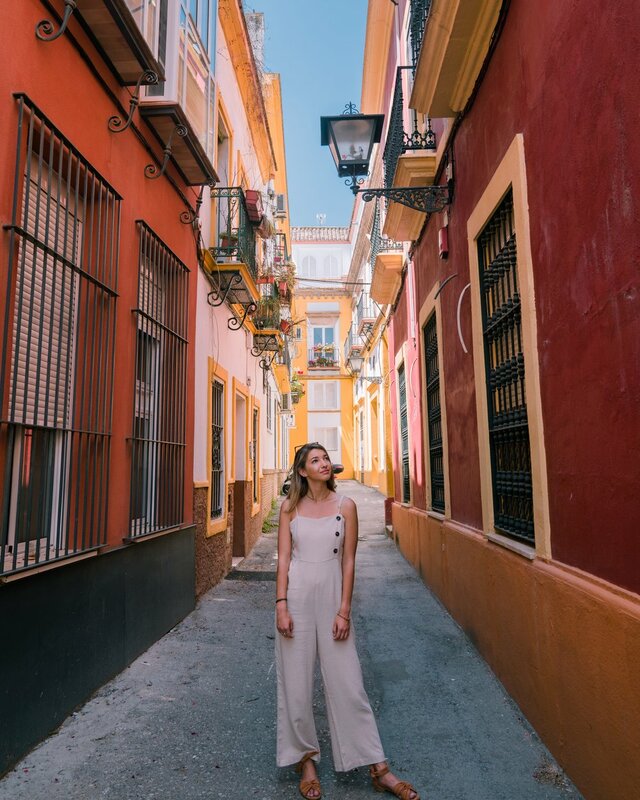 With the warm Spanish breeze in your hair, the Moorish, Gothic and Arabic blend of architecture before your eyes, it’s truly such an incredible city. And don’t get me started on the food! One word: Tapas. Make sure that you make time for some tapa hopping as there are endless tapa bars to try local drinks and cuisine! My favs were the spinach and chickpeas and potatoes with this amazing sauce. Honestly, I had so many potatoes while I was there, it was ridiculous. 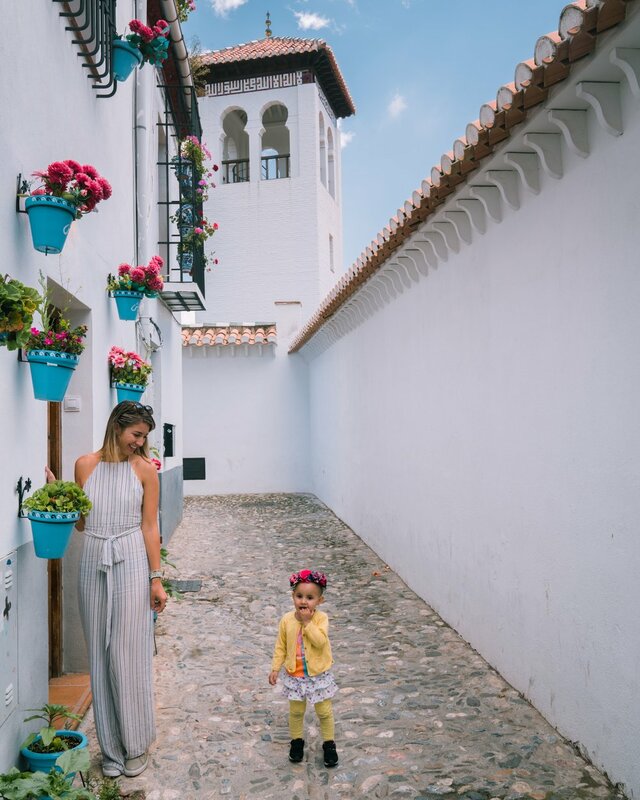 Oh Granada, how we fell in love with you. The charming college town was much smaller than Seville, but just as sleepless with a unique tapas culture that had people out all night tapa hopping. Only in Granada did we find a get a drink, and get a free tapa deal everywhere! Head into practically any bar and get a drink and either receive the tapa of your choice or they’ll choose one for you! Besides this lovely concept, the town of Granada was absolutely amazing! They had so many different districts packed into such a small space, it almost made my head spin. Being so close to Marrakech, you can definitely see the Moroccan influence, with a ton of shops and restaurants fashioned off the Moroccan city across the water. However, there were also a ton of other types of influence like Moorish, Jewish and Christian that all came together in this one little town. If you’d like to go see the Castle of Alhambra, which is one of the most famous Moorish castles in Europe, then I’d highly recommend booking your ticket a few months in advance. By the time we looked, it was fully booked. That being said, the view of the castle from the distance was absolutely breathtaking and we felt that that was fulfilling enough. Make sure you have good walking shoes on because you will be doing A LOT of walking. 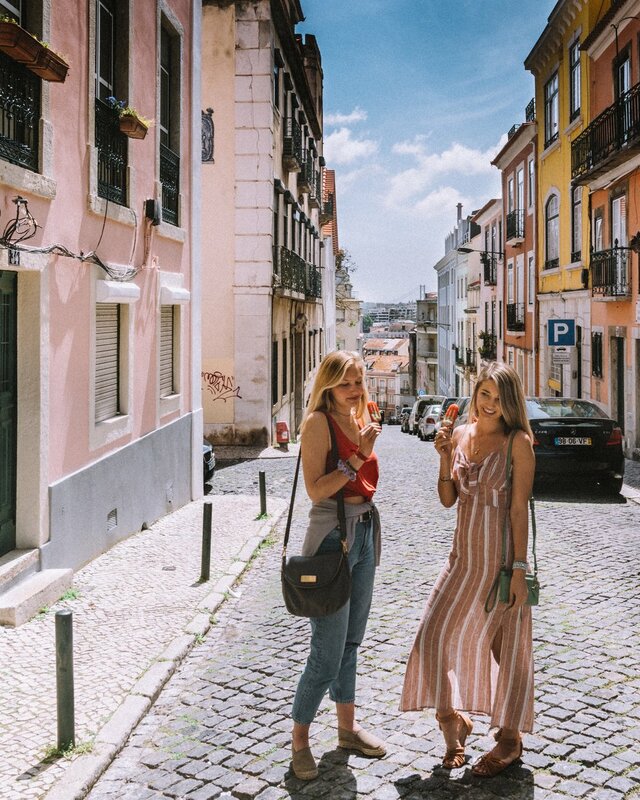 Similar to Lisbon, you can simply get lost in the winding streets. Malàga was my least favorite out of the entire trip, which isn’t to say it wasn’t extremely enjoyable, it’s just that it paled a bit to the other places we visited. That being said, it was still amazing. My favorite part was getting to go to the Picasso museum there, as it was his hometown and the museum contain a ton of his personal collection. It’s also such a fun city to go out in. We started out in the “El Palo” area which was right on the beach and had a bunch of fun restaurants and bars. After that, we headed to the Historic Centre district for a few clubs. One thing that I really enjoyed doing in Malàga was going to the botanical gardens. I’m not a huge botanical gardens person, but these were simply amazing! They’re described as one of the best gardens in all of Europe and I can see why! It’s grounds are huge, and it has everything from overhanging wisteria to a platform that you can see all of Malàga. The food at the cafe is also excellent. Heading back into Portugal for one last stop in Lagos is the perfect end to a perfect road trip. Make sure to stop your Hertz car along the way to get a few scenic pictures as there are plenty of cute little towns along the way. Lagos is so different than anything else on this trip that it was so worth going to! The town of Lagos itself is super cute, with cobblestone streets and a ton of boutiques and trendy restaurants. However, what really stole the show was the Algarves coastline. I didn’t expect the water to be such an amazing sparkling aqua, green color contrasted with the fiery oranges of the cliffs. If you’d like, you can book a tour to see the cliffs and even caves by boat, but we enjoyed ourselves fully just by hanging out at the beach and driving our car along the cliffs and stopping at different viewing spots. At the end of the day, we brought a bottle of wine up to one of the scenic views and watched the sunset. It was the perfect end to the day and to the whole trip! Lagos is also a great end to your road trip, because there is an international airport about 40 minutes away in Faro, which also has a Hertz location. One great thing about Hertz is that you can pick up a car from one location and drop it off in another so you don’t have to circle back! Head on over to Hertz to start your own amazing road trip experience in Europe!